Larks are passerine birds of the family Alaudidae. All species occur in the Old World, and in northern and eastern Australia. Only one, the Horned Lark, is native to North America. Habitats vary widely, but many species live in dry regions. They have more elaborate calls than most birds, and often extravagant songs given in display flight (Kikkawa 2003). 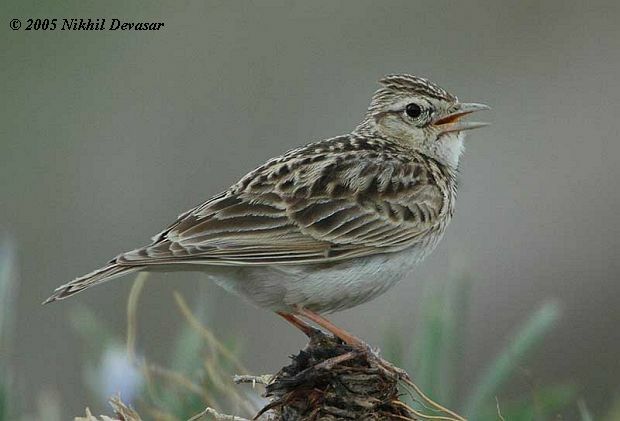 These melodious sounds (to human ears), combined with a willingness to expand into anthropogenic habitats — as long as these are not too intensively managed — have ensured larks a prominent place in literature and music, especially the Eurasian Skylark in northern Europe and the Crested Lark and Calandra Lark in southern Europe.